Before cooking any type of meat, you must find out what internal temperature must be reached for the meat to be safely eaten. This is important for several reasons. The first, and most important, is that you don't want to give anyone food poisoning or a food-borne illness by undercooking the meat, or leaving the meat in the 'Danger Zone.' The second is because you want to ensure that you are cooking your meat to your desired doneness (i.e. rare, medium-rare, medium, etc.) and not overcooking it. So, what is the 'Danger Zone?' 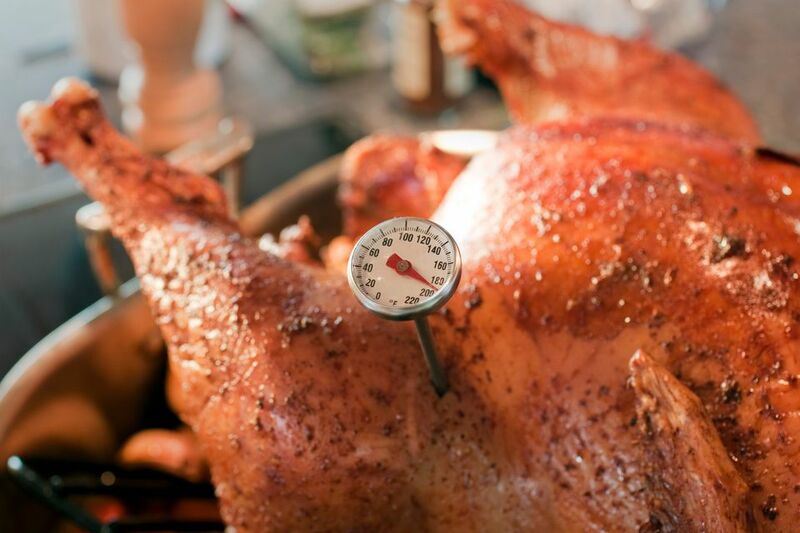 According to foodsafety.gov, the 'Danger Zone' is when foods are held between 40 F and 140 F for two or more hours. Food should never be held at these temperatures because most bacteria will quite happily reproduce in that range. These bacteria can cause food poisoning and food-borne illnesses, which in turn can make you very sick. These bacteria reproduce very slowly, if at all, below 40 F and above 140 F. But note that the temperatures at which bacteria are killed vary according to the microbe. For example, salmonella is killed by heating it to 131 F for one hour, 140 F for a half-hour, or by heating it to 167 F for 10 minutes. When it comes to killing microorganisms, both heat level and time affect the equation. There's also the issue of where the contamination is found. E-coli lives in the intestinal tract of animals, not the flesh. The danger is that in the process of butchering a cow or chicken, some of the contents of the intestinal tract may contaminate the exposed flesh. That's why it's relatively safe to sear a steak over high heat and still eat it rare or medium rare (125 to 135 F). That's also why all ground meat should be cooked to 160 F because the external flesh and internal flesh are mixed together during grinding. Trichinosis, which is a multi-celled parasite and not a bacterium, lives in the muscles and so searing the outside of, say, a pork chop won't kill any organisms in the meat, though it will taste better. Trichinosis is killed at 135 F, so it's safe to eat pork if it's cooked to at least 140 or 145 F. Though do remember, if the pork is ground, it should be cooked to 160 F.
Salmonella can sometimes inhabit the meat of poultry, so cooking chicken and turkey to at least 160 F is wise. Salmonella can also inhabit eggs and so there is a risk with soft-boiled eggs, omelets, and scrambled eggs if any part of the egg is left undone, like the yolk. Hence why pregnant women are advised not to eat these types of eggs. It's safe to cook meat and vegetables at low temperatures for longer periods or higher temperatures for shorter periods. And it's almost always safer to sear meat over high heat before cooking it at lower temps. For low-temperature cooking both for roasts and braises, it's a good idea to brown the meat first over medium-high heat (about 350 F) and then follow the recipe for cooking at a low temperature for a longer period of time. Heat alone isn't the only element in preventing food poisoning. There's also a toxicity factor. Some bacteria are simply more toxic than others, and some toxins hang around after the bacteria is dead. Most people with healthy immune systems can ingest a bit of salmonella or listeria and their systems will kill it off without them even noticing. Botulism toxins, though, are highly potent and dangerous, and even a small dose of the bacteria can have significant effects. Botulism occurs mostly in improperly canned goods, but can also appear in homemade sausage. Never take a chance on something that might contain botulism. If you want to be exceptionally safe, follow the USDA food safety guidelines and cook everything to at least 160 F. Again, never hold hot food below 140 F, and make sure to cool food you're going to refrigerate quickly to at least 40 F, so that you aren't flirting with the Danger Zone.